Diascia are native to southern Africa. They have large flowers, a compact growth habit, and good branching. Diascia flower in early spring through summer. 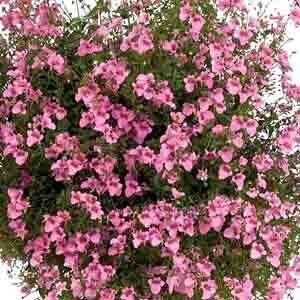 Use Diascia in hanging baskets, combo planters, or as a floriferous groundcover. Your customers may like that Diascia are easy to grow and attract pollinators. Regular watering is needed during drought, but only when the soil feels dry. For best results with Diascia, use a well-drained soil with a constant feed of balanced fertilizer (200 ppm N) that contains average levels of micronutrients with a slightly increased level of iron. Keep moist, but not over-watered, to prevent root damage. Maintain a pH between 5.5- 6.0 and an EC between 0.6 - 0.9. We recommend that you pinch Genta Pink once, about 10 days after transplanting to your final container (to allow roots time to establish). Diascia should be spaced adequately to allow airflow and light penetration between the foliage. Plant growth regulators are optional for Diascia, but not necessary under high light intensities. Use 1-3 sprays of ALAR (B-Nine) 2 gr/L according to required plant size. Aphids and whiteflies are the primary problem pests with Diascia. We recommend planting 3-4 plants for a 10” basket. Use a well-drained soil and plant your starter plants deep, allowing the ellepot to be completely covered by the soil. If you are growing 4” pots, use one plant per pot. Plant the liner directly in the middle of your pot. One pinch about 10 days after transplanting to your final container should be sufficient.